After a slight blog hiatus due to vacation, weather and work, I'm finally back to making repairs/updates to our Helms 25. 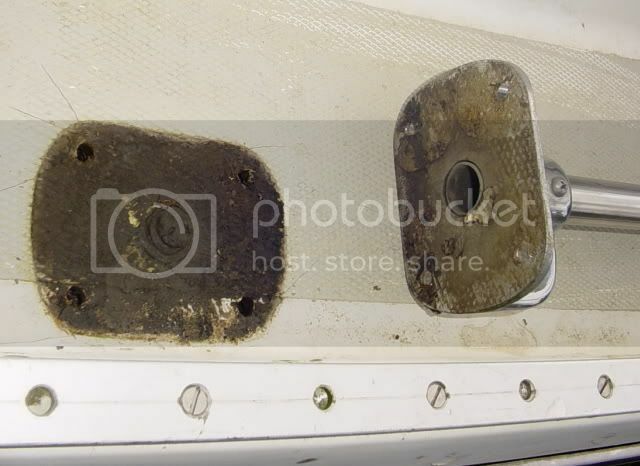 This week I'm focusing on rebedding most of the deck hardware to fix water leaks in the cabin, improve safety (lifeline stanchions, chainplates, etc.) and prevent any further water leaks into the balsa deck core. 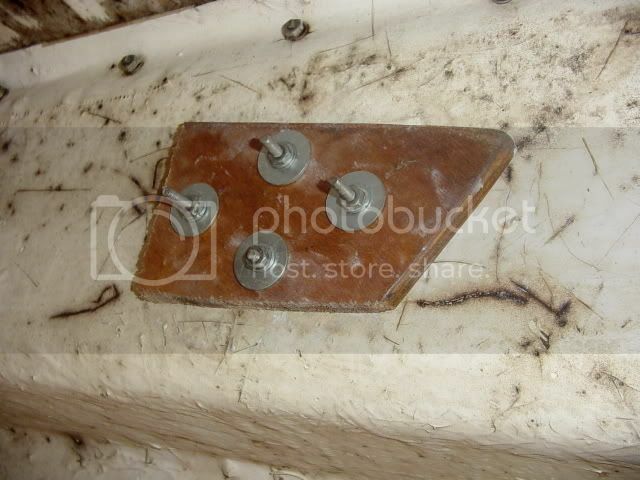 Speaking of deck core, ours is spongy and wet in many places on the coach roof and some of the sidedecks. However, we will likely not be ripping up the top layer of fiberglass, removing the old wet core and then relaying new fiberglass, gelcoat and paint. We realize this could be a mistake if the deck rot is worse than we think and it (God forbid!) leads to a de-masting or cleats/chainplates/toerails/blocks/winches/etc. breaking loose. The truth is, we just can't afford to re-core the deck and probably don't have the tools/experience to do it for this boat. I started with a couple of pieces of hardware that I know currently leak (2 stanchions, 2 chainplates). After loosening the through-bolts, I carefully pried the hardware off of the deck. Next I cleaned the bedding area and hardware bases with a wire brush and acetone. 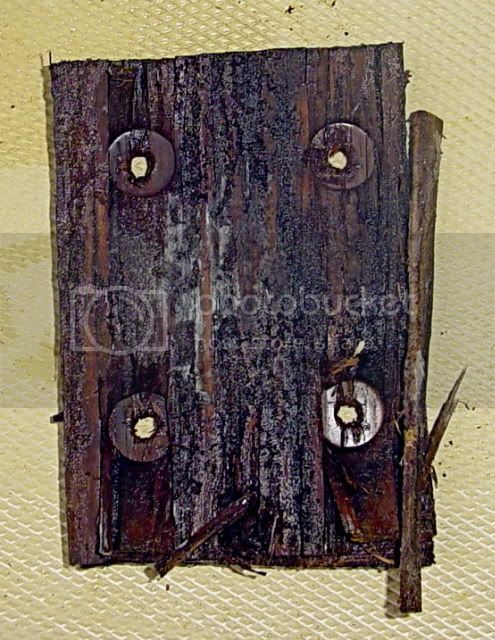 The chainplates had steel backing plates under the deck that were re-usable. The lifeline stanchions were backed with plywood that was completely rotted. I replaced the rotted backing with new marine plywood backing (thanks Dad!). Two-part marine epoxy was used to seal and bond the hardware bases with the fiberglass deck. Per Don Casey's recommendation, I did not seal the hardware on the underside of the deck so that future leaks are visible and can be fixed before they add to the deck rot problem. I carefully re-mounted and re-tightened (over a matter of hours) the hardware and then trimmed away the epoxy that seeped out after it had cured. Using masking tape on the deck saved a big mess of epoxy seapage. All in all, this wasn't a difficult project and I will feel much safer (and dryer!) knowing the deck hardware has been re-bedded. 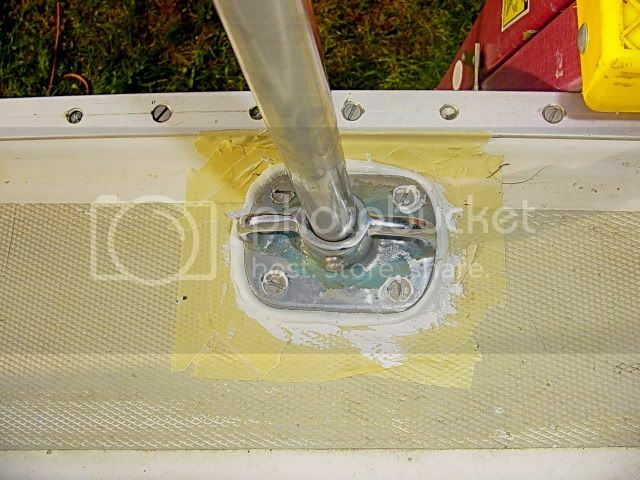 Do I understand correctly that you did not use a sealant between deck and the stanchion plates, but glued them together with epoxy? Doesn't that make removal impoosible later? That's correct, I used epoxy to permanently seal the stanchion bases, as this was a very old boat and I didn't plan to ever remove them again. If I were doing a hardware rebedding project today, I would probably use 3M 4200 for adhesive/sealant. As you may know, 4200 allows for removal if needed. It won't prevent leaks. All you are doing is gluing the base to the gelcoat. You will simply crack the gelcoat in the future and water will leak thru the crack into the core below. Fair enough David. This was a project I undertook on our first sailboat (the Helms 25 mentioned in the post) back in 2007. If I was going to re-bed deck hardware today, I'd probably take a slightly different approach...mainly by not using epoxy as the sealant/adhesive.